The nail-biting climax of one of the greatest political battles in American history: the ratification of the constitutional amendment that granted women the right to vote. Nashville, August 1920. Thirty-five states have ratified the Nineteenth Amendment, twelve have rejected or refused to vote, and one last state is needed. It all comes down to Tennessee, the moment of truth for the suffragists, after a seven-decade crusade. The opposing forces include politicians with careers at stake, liquor companies, railroad magnates, and a lot of racists who don't want black women voting. And then there are the "Antis"--women who oppose their own enfranchisement, fearing suffrage will bring about the moral collapse of the nation. They all converge in a boiling hot summer for a vicious face-off replete with dirty tricks, betrayals and bribes, bigotry, Jack Daniel's, and the Bible. 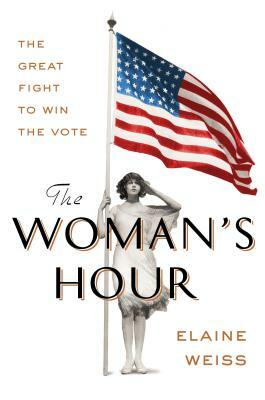 Following a handful of remarkable women who led their respective forces into battle, along with appearances by Woodrow Wilson, Warren Harding, Frederick Douglass, and Eleanor Roosevelt, The Woman's Hour is an inspiring story of activists winning their own freedom in one of the last campaigns forged in the shadow of the Civil War, and the beginning of the great twentieth-century battles for civil rights. Elaine Weiss is an award-winning journalist and writer whose work has appeared in The Atlantic, Harper's, The New York Times, and The Christian Science Monitor, as well as in reports and documentaries for National Public Radio and Voice of America. A MacDowell Colony Fellow and Pushcart Prize Editor's Choice honoree, she is also the author of Fruits of Victory: The Woman's Land Army in the Great War (Potomac Books/University of Nebraska Press). "Weiss's excellent work of cross-disciplinary scholarship offers readers a unique look at how WWI changed society." "Weiss effectively chronicles the birth of the WLA movement and the dedicated women behind it. Recommended for both scholarly readers and interested history buffs."